T-shirts, tank tops, and shirts – Your tops will be the basis for the rest of your attire, therefore pack a variety of options with both short and long sleeves, depending on the weather. Use tank tops as your base layer in warmer climates, or heat-tech tops in cooler climates. On days where temple visits are on your itinerary, take a top that covers your shoulders. Pants – Include jeans, trousers, khakis, or linen pants based on what makes you feel more comfortable. Pack pieces that are versatile enough to wear while walking around the city, and that you can dress up with a shirt or fashionable blouse. Sweaters – Hoodies, cardigans, and light sweaters come in handy on cooler days, or at locations with air conditioning. It is wise to have an extra layer available so you may feel comfortable at all times. 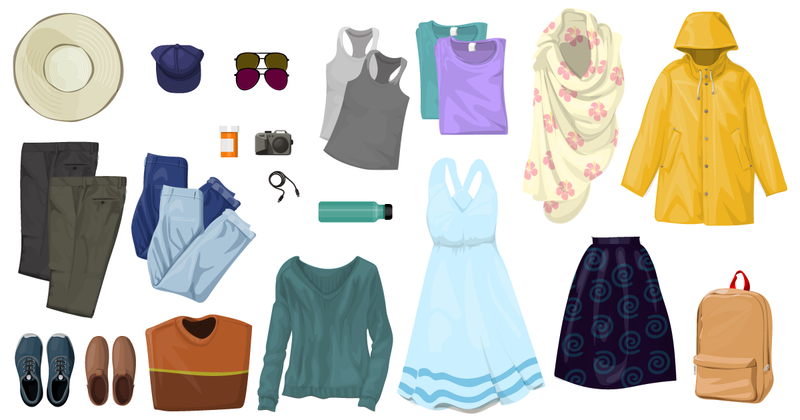 Sarong/shawl – A sarong is a multipurpose item and a must-have for your tour. Wrap it around your waist when relaxing at the pool, wear as a scarf, cover your head in hot or rainy weather, or use as a shawl to give any outfit a sophisticated look. Shawls and sarongs also come in handy for visits to religious sites, as you can wrap them around your shoulders, or wear them around your waist if you are wearing shorts. Dresses and skirts – Light summer dresses, maxis, and skirts are a great option for women when the weather feels too hot for pants. Mix and match your dresses with the cardigans or shawls you packed for different looks throughout your vacation. Raincoat – If you are booked on a Southeast Asia cruise, there is a good chance you will experience rain every now and again. Showers are common, if only for a few minutes each day in many countries. Packing a light raincoat in your luggage will keep you sheltered so you can stay dry during these downpours. Walking shoes – Construction is quite common throughout Asia and when walking around, you will find many areas with uneven, rocky, or non-existent sidewalks. A comfortable and durable pair of walking shoes with sturdy heels will reduce the impact on your feet and knees. Make sure they are also breathable to allow your feet maximum airflow, as they may feel warmer than usual in Asia. Hat(s) – The sun can be brutal in Asia, especially in Southeast Asian countries. Pack a hat with a wide brim to avoid sunburn, which can lead to discomfort and pain during your trip. You will notice that many locals also wear hats for protection against the sun. Men who are not interested in wearing a hat with a brim may opt for a standard baseball cap instead. Sunscreen – Protect your skin with sunscreen that has a higher SPF than you would typically wear at home. Pack a brand you have used before to avoid unexpected skin irritation. If your skin is sensitive, keep a travel-sized tube of sunscreen with you during the day in order to apply regularly. Lightweight backpack – Instead of using a shoulder bag during your daytime excursions, use a lightweight backpack. Backpacks will distribute the weight of your essentials evenly, while still leaving your arms and hands free. Choose a backpack that can hold your camera, wallet, snacks, water, and sunscreen. Electronics and adapters – Outlets in many Asian countries are different than outlets in America. Pack a transformer or adapter to ensure you can charge your camera, tablet, laptop, batteries, etc. Toiletries and medicine – Pack lip balm, mosquito repellent, shampoo, conditioner, soap, body lotion, eye drops, hand sanitizer, and other essential items you use on a daily basis. There’s no guarantee you’ll be able to find toiletries with English text in various parts of Asia, so rather than getting frustrated in these situations, plan ahead and bring them along. Sunglasses – Protect your eyes and keep them shaded when the sun is at its peak. Even if you are wearing a wide brimmed hat or baseball cap, err on the side of caution. In addition to the items listed above, you may want to consider packing some of your favorite snacks. While you will try the local cuisine at your destination, it’s always nice to have a piece of home during those times when you want to eat something familiar. Traveling to Asia is a wonderful experience, so there’s no reason to worry about your luggage. Pack these essentials so you can focus on all the interesting locations you will see, and on making a new set of friends!